Waterfall tegenungan prima donna attractions in Bali, waterfall in Bali is usually identical to the mountainous region, but tourist spots in Bali look different. Tegenungan waterfall is located in the lowlands. The height of the waterfall is approximately 4 meters with a water discharge so profusely. If you want to bathe in this tourist area, there is no harm. Near the Tegenungan waterfall is also a natural shower there are several that you can use as a place to bathe. Attractions waterfalls of Tegenungan, situated close to tourist Sukawati market which is the art market that sells a wide range of souvenirs of Bali. Here you can get a variety of gifts for the family on your closest relatives after a vacation in Bali. To visit the sights of waterfalls Tegenungan is advised to wear your own vehicle. Because in these sights are not available public transportation. You can use the services of a rental car with a driver that many offered by travel agents. In addition to saving on costs because the price is calculated per one day tour is not a price per hour, can also relax in the vehicle without having to think exposed jammed. the address of the Tegenungan Waterfall tourist attraction located in the village of Kemenuh, Sukawati, Gianyar Regency, Bali. It is about 30 kilometers from the Centre of Denpasar. And if travel by vehicle from the Ngurah Rai International Airport will take approximately one hours drive. 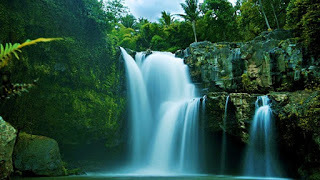 Attractions Waterfalls Tegenungan is one of the attractions of Bali are interesting to visit. Tourist falls in Bali is one of the closest waterfalls from Ngurah Rai airport. These sights are increasingly popular among domestic and foreign tourists. Most of the travel agents who sell Bali tour program enter attractions waterfalls Tegenungan these into packages that lead to the tourist's area of Ubud Kintamani and sights.